Dramatic weight loss success stories often begin with a life-defining moment. But for 37-year-old Tracy McLaughlin, who weighed more than 260 pounds three years ago, her "Aha!" moment was more simple. McLaughlin set out to lose weight and ended up replacing her food addiction with another addiction -- running. But it wasn’t until she saw a friend complete last year’s NYC Half Marathon that she thought, "Why can’t I do that?" 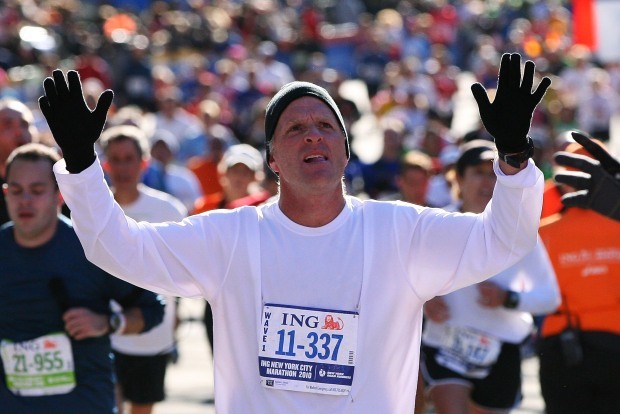 At Sunday's 2011 NYC Half Marathon, which runs through the heart of Times Square and is one of New York’s most popular road races, McLaughlin, who has lost more than 120 pounds, will be among 9,000 runners. They toe the line in Central Park and make their way down to Battery Park for the finish. McLaughlin, a nanny who moved to New York from New Zealand 16 years ago, struggled with her body image when she was young. “I remember my mom taking me to Weight Watchers as a kid and, looking back, I wasn’t even overweight,” she says. McLaughlin's insecurities fed a cycle that eventually made her turn to overeating. McLaughlin's transformation began slowly. She joined a gym and began walking on the treadmills and occasionally broke out into a trot. “Five minutes was a big deal,” she said. Eventually, the Upper East Sider began running to Central Park, but she was still too embarrassed to run in public. “I used to go at night after dark because I didn’t want people seeing me running,” she said. But as her fitness improved, so did her confidence. McLaughlin surrounded herself with friends and running partners from the New York Road Runners. She said she's not at her ideal weight yet, but the period of feeling bad about herself is over. Others are still getting used to it: her hairdresser didn’t recognize her last time McLaughlin visited. After Sunday’s race, McLaughlin will cast her sights on a larger goal: the 26.2-mile New York City Marathon. Three or four years ago, she says, that idea wasn’t even in her mind.